This appears to be an interesting bonus that has come my way. Last week, or rather the week before because I got held up finishing this post, a tweet forwarded on by my PLN notified me of a webinar run by Jenny Mackness and SCoPE that was shortly getting under way, “what is emergent learning? why is it relevant?“. Not a topic that I know much about, only that it had been recommended by my PLN and that I happened to be free at the given time – so why not!! It transpired that this would be the first of two webinars. In the first one we’d be introduced to the concept of emergent learning and in the second we’d be shown how to draw a footprint identifying the mix of emergent and prescribed learning experienced within a particular learning event. “learning that happens when a large number of self-organising people interact frequently, in an adaptive, open environment, with considerable degrees of freedom and minimal constraints; no individual can see the whole picture; agents and system co-evolve”. That being the case, it immediately put me in mind of the learning experience I’d just had in the open online seminar, Exploring Personal Learning Networks, because I have to say that some of the learning I experienced there was probably some of the most challenging I’ve faced in a long time, possibly ever! So yes, I’d definitely be interested to try and map a footprint of that. 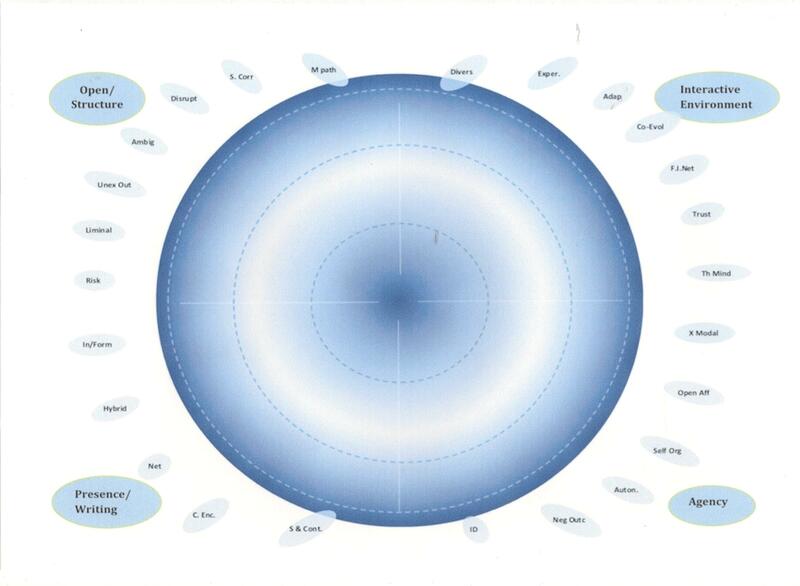 Footprints can be used to map not only the learning experience but the design intentions also. They’re also time contextual, so they can be drawn as a series over time by an individual. So what is a footprint? With complex learning environments in mind, they aim to represent the pedagogy and design elements of a course in an easily accessible and visual way. 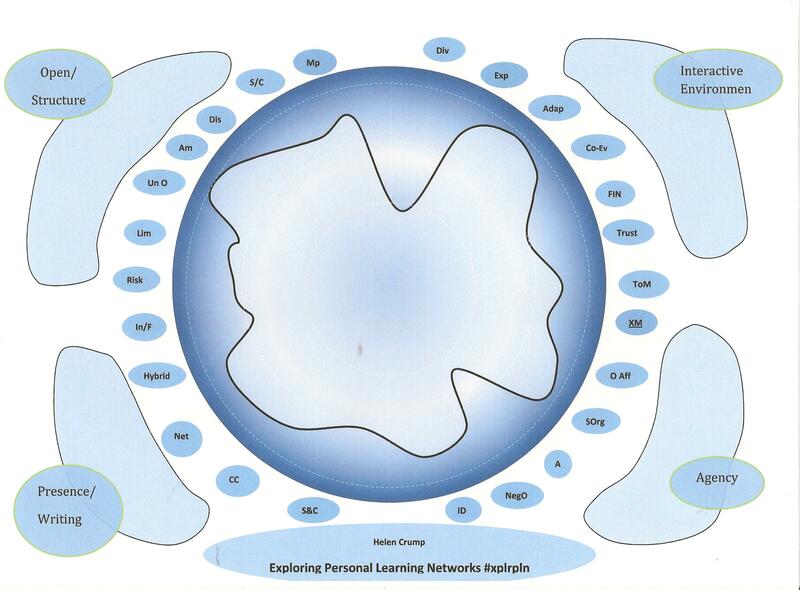 The footprint is developed around a series of circles with the more structured, prescribed part of the learning experience towards the center, and the more “emergent” self-directed, connectivist elements towards the outside, and beyond which is “chaos”. 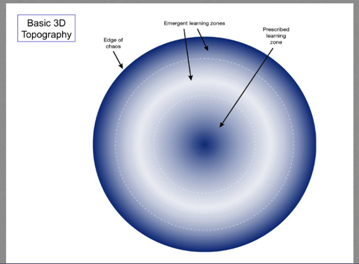 The white shaded area represents what’s seen as the “sweet spot” for emergent learning. and in each quarter is a number of elements that can be mapped across the spectrum of circles and then joined up to create the footprint. The more inward parts of the footprint represent the more prescribed or directed elements of the learning experience, and the more outward parts represent the more emergent elements. And here is the link to resources you’ll need in order view the mapping elements and to draw a footprint of your own. There is also a handy video to guide you through the process. The activity is quite detailed, and in truth requires some amount of effort to fully understand the elements to be mapped, but once you’ve grasped those, I’d say that a footprint, such as the one I drew below, has a lot to offer as an attempt to describe and understand the dynamics at play in the learning experienced in these new and complex open environments. It was an interesting and worthwhile activity, and I’d be interested to see what the course #xplrpln facilitators, Jeff Merrill and Kimberley Scott, make of my footprint, and indeed maybe see one of theirs from a design point of view. When I get permission, I’ll upload my completed mapping sheet to the emergent learning wiki so that it’s possible to see how I arrived at my footprint.